Do you like the title of this post? Is it catchy? Humorous? Weird? Clever? Well, maybe not clever. The point is though, that the title of this post kind of hints at what you might expect in this post but it really doesn’t give you a great idea of what it really contains. It’s just a title. It’s not the whole story. By now I’m sure you have it figured out, I’ve hopefully made the point.. right? A label doesn’t tell the story. A label is just a title. Right? Wow, this was a short post. I’ve heard from some people that suspect that their child could have autism, or at least some autism-like traits… and they’re afraid to bring it up with their doctor. They don’t want a diagnosis because they don’t want their child to have the label for the rest of their lives. Then there are those who do get the diagnosis for their child and refuse to believe it. They absolutely will not believe that their child must bare this label for the rest of their lives. They try to pretend that the diagnosis never happened and simply continue to raise their child as they would have anyway… forgoing advice, help and services. What that means is that early intervention can go a long way to helping your child progress, grow and develop the skills they need to be successful and independent adults. Any delay can hinder that progress. One year missed in the early stages can take several years to repair later in life. People… ALL PEOPLE… develop in their early years and what is established early is what makes up their core personality later in life. There have been a lot of discussions (quite heated actually) around the autism community because some parents are claiming to hate autism, and really… I can’t blame them. For some people, their child will likely live in a home for the rest of their lives. They’ll be bullied, they’ll have no job, no family… they’ll miss out on a lot in life. Still though, in this case, I think it’s a label issue more than anything. I look at this way: when a child misbehaves or does something wrong, “experts” and books teach us that as parents, we should redirect or encourage proper behavior… but if need be, point out how what they did was bad, not that they were bad. Or to put it another way, never tell your child they are bad, but rather that the action they took was wrong. In this way, as an example, hitting is bad, not the child that did the hitting. To go back to autism, I think the parents hate that their children can not speak, can not integrate into society, can not do all of the things the parent wishes they could do… due to the autism. 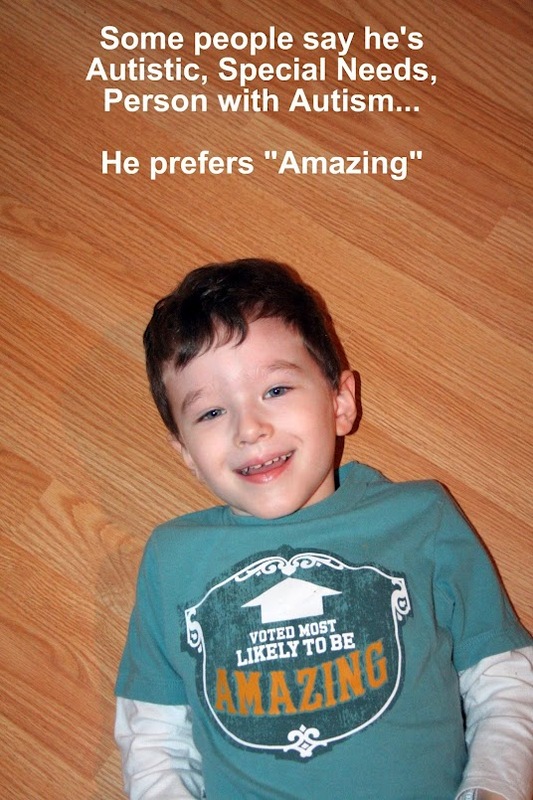 They hate the barriers, the severity… not the actual autism itself. They hate that they haven’t found a way to communicate. Sure Carly Fleischmann (go buy her book by the way!) found a way to communicate despite being unable to speak… but to a parent that has yet to find a way with their own child, they’ll hate it. They’ll hate that they can’t communicate. They’ll say that they hate autism… it’s an emotional response. It doesn’t make it right, any more than telling your child that they’re bad when they do a bad thing. The experts are right. It is better to focus on the action than the person. But as an emotional response… it’s understandable, even if not really right. Labels… sometimes they get mixed up in the heat of the moment. Yes, there is a lot of power in words and choosing which label you want to use does have an impact on how you think about a person. Still though, it doesn’t have an impact on who that person is. You’ve labeled a person. They’re still a person that doesn’t really reflect the label at all. I know, some people would and likely will argue with me that it does reflect the person, but going back to the beginning of this post, a title hints but does not tell you the story. I know some autistics that don’t care what you call them and have no interest in the autism community or advocating at all. They just live their life as a person who lives their life. For those people, calling them autistic or a person with autism or lazy or big boned or funny looking or anything else doesn’t really tell you anything about the person at all, does it? Maybe to Sherlock Holmes, but for most people, we wouldn’t have a clue where they’ve lived, the type of people they hang out with, what their favorite food is… nothing. Insisting on a label, or fighting over a label, seems like an odd way to spend your time when you could have been learning the story instead. For the most part, I’ve been down playing labels in this post. I don’t want you to think that I am completely dismissing how important they are though. Although, I attribute a lot of that to just how lazy or assuming people are. The greatest example of this is in the media. I believe we’re all aware of news agencies common practice of “sensationalizing” a headline to grab readers. I wrote about it in “The truth about how a research study goes from the lab, through the media, to the people” where you can actually see how a story goes from a researcher to the public and just how radically the headline can change over time. The danger of this, which happens far too often, is that many readers will take the headline and be satisfied with it. They’ll come to conclusions and share it without having ever read the actual story. This translates into the real world of labels where, when someone says autism, a person might automatically think they know all about a person. They assume that an autistic will be prone to violent meltdowns, they won’t look a person in the eye, they won’t be able to talk properly or at all, they’ll spin around or flap their hands a lot… any number of things. Find any 5 autistics that you can and you’ll quickly find that these generalizations are just silly. Sure, one or two might do one or two of the things I’ve listed… but more than likely, all 5 will be completely different where none of which do all of those things. And those are just possible autistic behaviors. That is a far stretch from assuming you know a person. So yes, labels have their power, because people want to make assumptions based on them. They want to know the story before they know the story. A label is just a label… it’s a short form reference to an entire story that you have yet to discover. There’s a whole lot more to The Lord of the Rings than it’s title and there’s a lot more to a person than the title you label them by. So make sure you use a label properly, use the label you prefer most and most of all… never assume you know the story based on the label. My son’s label is ‘Amazing’. If you want to know why, you’ll have to get to know him and learn his story. I LOVE it Stuart … I should probably start using the label I gave my kids all the time, instead of sometimes … I say they have a touch of “awesomeness” — it makes people stop to think a little beyond the titles like autism, epilepsy, cerebral palsy and all the other things on their medical records.